Professor Martin Siegert, Director of the Bristol Glaciology Centre from the University of Bristol, is the leader of a consortium to study subglacial Lake Ellsworth in West Antarctica. As co-Chair of the Antarctic Climate Evolution Programme (ACE) and a member of the Subglacial Antarctic Lakes Exploration group (SALE) , the broader focus of Professor Siegert's work is climate-related numerical modelling of large ice masses. 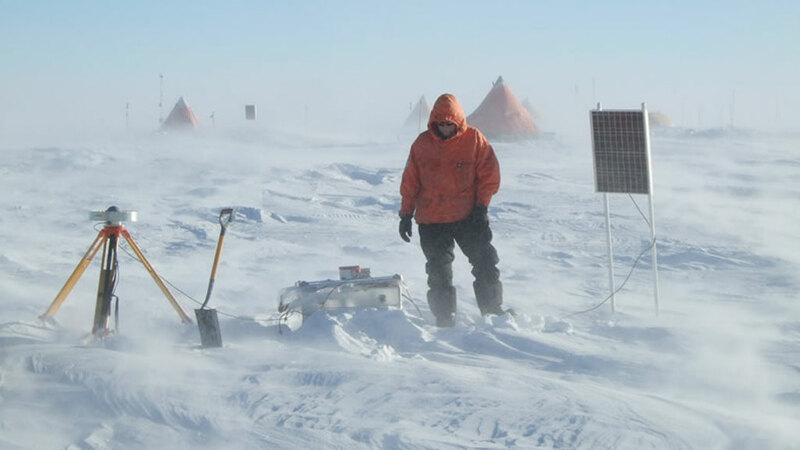 In this interview, Professor Siegert discusses our current understanding of Antarctic subglacial lakes and the ongoing research to better understand the role they play in Antarctica's subglacial hydrological system. The past decade has seen an incredibly rapid increase in our understanding of Antarctic subglacial lakes and environments. How did we get to where we are? Subglacial lakes research began in the mid-90s. At that point, we had known about subglacial lakes for about 20 years, but they had never really captured our attention and virtually no work had been done on them. The first thing that happened is that satellite altimetry came along and enabled us to read where large subglacial lakes are located by looking at the surface of the ice sheet. The second thing was that through some data-mining, a team in which I was involved put together this new satellite data with some old radar data, and some very old seismic data collected by Russian scientists in the 1960s. This enabled us to determine that one very large lake, Lake Vostok, was not only very large, but also very deep - some 500 metres deep. Those findings were published in the journal Nature in 1996, and for some reason it just captured the mood of the media and became very visible. Before that, glaciologists had not been that interested in subglacial lakes as they didn't think that these lakes would effect glacial flow too much, which of course turns out to be wrong. And what about the role of microbiologists? At around the same time in the 1990's, microbiologists also started thinking about subglacial lakes as environments where things can live and survive in isolation for long periods of time, which is very interesting from a microbial, and possibly evolutionary perspective. Biologists who were particularly interested in Lake Vostok set up a committee of specialists to look into what exactly needed to be done to do subglacial lake exploration, and to establish a timeline of how to go about it. One of the burning questions, of course, was to establish which subglacial lake to access first: Was it Lake Vostok, or indeed another lake? Slowly, several nations brought their relevant information together. And despite the interest in accessing Lake Vostok, it became clear that it wasn't in fact a good candidate for exploration. It was just too big, too deep, too complex, and too difficult to comprehend at this early stage. That's when I started to think about exploring other lakes, and to try and put together a UK team to try and do that. So would it be right to say that the impetus to study subglacial lakes came from biologists, rather than from glaciologists? Yes, I think that's right. Microbiologists wanted to get into subglacial lakes, but they were a long way from doing that. First, we needed to survey them and draw up inventories and that sort of thing. This undertaking had to be done by glaciologists. What came out of it was an early interdisciplinary type of conversation between people who hadn't really spoken to each other before. I was involved with some of that, which was interesting for me, even if I still wasn't convinced about how interesting this was ever going to be from a glaciological perspective. What eventually convinced glaciologists that subglacial lakes were in fact relevant to their work? About four or five years ago - again using satellite data - we determined that the surface of the ice sheet above subglacial lakes can go up and down as a consequence of water filling and flushing out of the lakes. All of a sudden glaciologists began to realize that subglacial lakes were not isolated, stagnant pools of water, but instead part of a much more dynamic su-glacial hydrological system. And as we know from other areas of glaciology, wherever there is a base of water flowing around, there is a strong connection between the controls on the base of water and the control on ice flow. So we became interested in what subglacial lakes could tell us about subglacial hydrology, which in turn could inform us about how the ice sheet flows now, and how it has flowed in the past. Right now, it's all coming together quite nicely, and for the first time we recognize that subglacial lakes are interesting from a biological perspective, from a paleo-climate perspective, and also from a glaciological perspective. And what's more, we have three upcoming and separate programmes that are going to drill into subglacial lake environments. Can you explain how the inventory jumped from around a dozen lakes to 150? Going right back, the first lake we detected using radar was in 1969. That was Lake Sovetskaya in middle of East Antarctica. The first inventory of 17 subglacial lakes was published in Nature by Gordon Robin and Gordon Osborn in 1973. That was pretty big news at the time. In about 1977, evidence of other subglacial lakes, including Lake Vostok, was published by the Royal Society in London. And then you have to skip another 10 years or so to 1986-87, for a PhD thesis by Neil McIntyre, which put together evidence of about 40 or 50 subglacial lakes in Antarctica. In the 1990s, it became clear to me and others I was working with that there hadn't been an inventory on subglacial lakes published for nearly a decade, but that a lot of information had been gathered during that time. So working with Neil McIntyre and others we put together the inventory of subglacial lakes (from past knowledge) and accounted for 77 subglacial lakes. Ten years on from then the inventory needed updating again because there was much more radar data that had been collected. So in 2005, I put together the second inventory of subglacial lakes, which accounted for about 145. Subsequently, four years later, we get to the point where satellite altimetry showed lakes filling and flowing, and more lakes everywhere. Finally, just this year, Ben Smith published an inventory that just shows where the inflow and outflow lakes are. In a couple of years, it will probably be time for us to put it all together again. There are certainly many more subglacial lakes - hundreds and possibly over a thousand. Would the vast majority of them be interconnected? I would have thought the majority would be in some way or other, because even water that flows in the middle of the ice sheet could flow into other subglacial lakes. But not all subglacial lakes will be connected to all subglacial lakes. They are organised in a sort of hierarchical catchments system. But there will be lakes which are in isolated places and that, just like some lakes on the surface of our planet, are not connected to rivers flowing in and out. So I imagine that once all subglacial lakes have been identified, the next big thing will be identifying how many regional systems there are? That's right, we have the models available to do that, and I've been involved in some of that work, but the constraint we've got is that for some parts of Antarctica we have very little data and our estimates for these parts risk being very inaccurate. How important do you think they are in terms of flow and ice mass balance? I think that's still to be determined. What we've appreciated from satellite data is that subglacial lakes are part of a dynamic system, far more dynamic than we had thought previously. You mentioned that in the 1990's you started to think about exploring lakes other than Lake Vostok, and you eventually settled on a lake called Lake Ellsworth. Why was this lake chosen, and what questions do you hope it will answer? In order to select the best candidate for exploration, we applied a set of criteria: Is the lake representative of other lakes? Are the logistics available? What is the surface temperature? What are the climate conditions? What is the ice thickness and how easy is it to get into? And under these criteria, Lake Ellsworth just stood out. It's in West Antarctica, which means there are interesting glacial history questions we can ask about the dynamics of the West Antarctic Ice Sheet, and that's interesting in itself from a glaciological perspective. Furthermore, the ice is 3,000 metres thick, or on the low side for a subglacial lake. But it's still a deep subglacial lake, which means that if there is life in it, it will be living in a similar way to life in all subglacial lakes. And finally, from a UK perspective, it is something the British Antarctic Survey (BAS) can contribute to because it is within its logistical zone, and access to it is relatively easy. What countries and institutions are you collaborating with? It's a UK-led project funded by the UK National Environmental Research Council (NERC), which means that we have the British Antarctic Survey and some ten or so UK universities involved. This represents 30 or so scientists, and it's taken about five years to put a consortium together and plan what we're going to do. There is some interest with some U.S colleagues and we've been working with some German colleagues on some modelling aspects. And there is possibly some interest from New Zealand too, but mostly UK. The budget is something quite complicated to calculate, but certainly over £7 million. We are planning to build a drill and do the drilling in December 2012. Martin Siegert is Director of the Bristol Glaciology Centre at the University of Bristol. He is a glaciologist specialising in the measurement and modelling of large ice sheets. He obtained his PhD in ice-sheet modelling from the University of Cambridge in 1993, and since then has worked at several UK Universities. He was recently Head of the School of GeoSciences at the University of Edinburgh, Chair of the UK National Committee on Antarctic Research, and UK delegate to the Scientific Committee on Antarctic Research (SCAR). In 2010 he con-convened the 6th international symposium on Antarctic subglacial aquatic environments in Baltimore, USA, and in 2011 he chaired the the 11th International Symposium of Antarctic Earth Sciences in Edinburgh. He has published three books and over 150 articles on his research into glacial processes and ice-sheet history. He is the lead Principal Investigator of the UK-NERC Lake Ellsworth consortium.